The Crowcon personal multigas monitor system is ideal for monitoring oxygen, flammable and toxic gases. The tetra personal monitor is a reliable and robust multigas monitor unit with a built-in optional internal pump. It is single button operated and features fully shockproof construction, self checking software and intelligent sensor modules. The Crowcon Tetra multigas personal monitor has been designed to be simple to use with an easy to read backlit display and highly robust construction designed to be flexible and to resist vibration and shock. 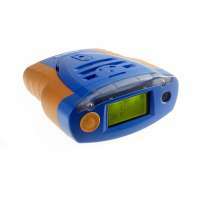 It has a 94 dB alarm, red/ blue visual alarm that is highly visible and a vibrating alarm. Powered by a rechargeable li-Ion battery this allows the user 12 hours of continuous use. Fully IP 65 compliant, this unit offers a high resistance to dust and water ingress and is fully compatible with Crowcon portables PC software. The intelligent sensor modules are fully interchangeable and this unit weighs in at just 498g. Calibration is available for flammable gases like Hydrogen, Propane, Butane, Pentane, Ethylene and Methane as standard, as well as safe CO2 carbon dioxide measurement (0-0.5%). This unit can easily handle bump test or four gas simultaneous calibration and can easily connect up to either checkbox IMH packages or PC software to allow calibration, configuration control and the management of data including report creation and printing. This unit can be charged either from a standard mains supply, or vehicle lighter socket for use in vehicles.